Relics found in the city's Baojiyan (simplified Chinese: 宝积岩; traditional Chinese: 寶積巖) and Zengpiyan (Chinese: 甑皮巖) caves that dates back to approximately 10,000 years ago. The Zengpiyan people had a matriarchal clan society. Before the Qin dynasty, Guilin region was settled by the Baiyue people. In 314 BC, a small settlement was established along the banks of the Li River. During the Qin dynasty's (221–206 BC) campaigns against the state of Nanyue, the first administration was set up in the area around Guilin. The modern city was located within the Guilin Commandery (Chinese: 桂林郡), which is origin of the modern name "Guilin". 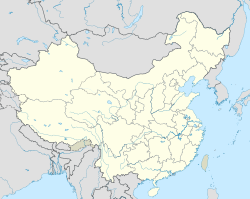 In 111 BC, during the reign of Emperor Wu of the Han dynasty, Shi'an County (simplified Chinese: 始安县; traditional Chinese: 始安縣) was established, which could be regarded as the beginning of the city. 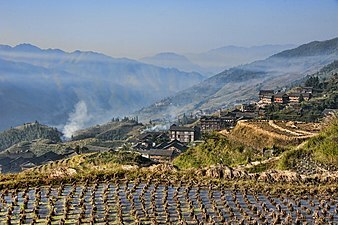 In AD 507, the town was renamed Guizhou (Gui Prefecture, Chinese: 桂州). In 634, Lingui County was established at the modern site of Guilin, under Gui Prefecture. In 868, Pang Xun rebelled against the Tang from Gui Prefecture. Guilin prospered in the Tang and Song dynasties but remained a county. The city was also a nexus between the central government and the southwest border, and it was where regular armies were placed to guard that border. Canals were built through the city so that food supplies could be directly transported from the food-productive Yangtze plain to the farthest southwestern point of the empire. In 997, Guangnan West Circuit, predecessor of modern Guangxi, was established, with Guizhou as the capital. 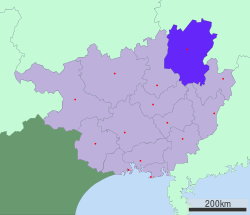 In 1133, Guizhou was renamed Jingjiang Prefecture (simplified Chinese: 静江路; traditional Chinese: 靜江路). In 1367, the name was changed to Guilin Prefecture (Chinese: 桂林府). In 1921, Guilin became one of the headquarters of the Northern Expeditionary Army led by Sun Yat-sen. In 1940, Guilin City was established. In 1950, the provincial capital of Guangxi was moved from Guilin to Nanning. In 1981, Guilin was listed by the State Council as one of the four cities (the other three being Beijing, Hangzhou and Suzhou) where the protection of historical and cultural heritage, as well as natural scenery, should be treated as a priority project. 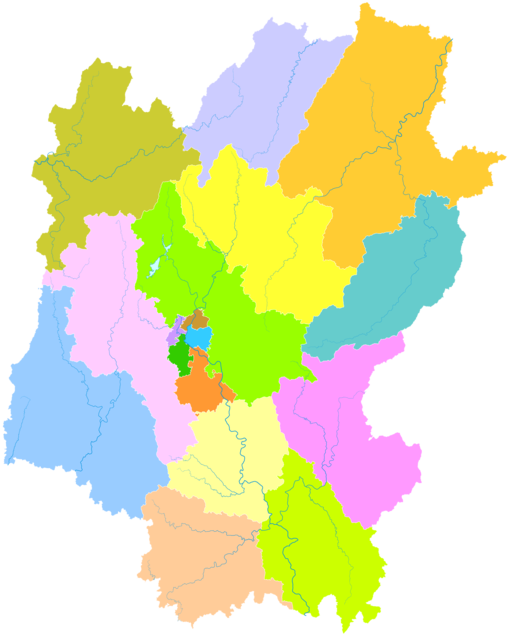 Guilin administers seventeen county-level divisions, including 6 districts, 8 counties, 2 autonomous counties, and 1 county-level city. Guilin is located in northern Guangxi, bordering Liuzhou to the west, Laibin to the southwest, Wuzhou to the south, Hezhou to the southeast, and within neighbouring Hunan, Huaihua to the northwest, Shaoyang to the north, and Yongzhou to the east. It has a total area of 27,809 square kilometres (10,737 sq mi). The topography of the area is marked by karst formations. The Li River flows through the city. Guilin has a monsoon-influenced humid subtropical climate (Köppen Cfa, bordering on Cwa), with short, mild winters, and long, hot, humid summers. Winter begins dry but becomes progressively wetter and cloudier. Spring is generally overcast and often rainy, while summer continues to be rainy though is the sunniest time of year. Autumn is sunny and dry. The monthly 24-hour average temperature ranges from 8.1 °C (46.6 °F) in January to 28.2 °C (82.8 °F) in July, and the annual mean is 19.12 °C (66.4 °F). The annual rainfall is just above 1,888 mm (74 in), and is delivered in bulk (~50%) from April to June, when the plum rains occur and often create the risk of flooding. With monthly percent possible sunshine ranging from 14% in March to 53% in September, the city receives 1,487 hours of bright sunshine annually. Statue of Ma Yuan at Fuboshan, Guilin. The GDP per capita was ¥19435 (ca. US$2858) in 2009, ranked no. 125 among 659 Chinese cities. Until 1949 only a thermal power plant, a cement works, and some small textile mills existed as signs of industrialization in Guilin. However, since the 1950s Guilin has electronics, engineering and agricultural equipment, medicine, rubber, and buses, and it also has textile and cotton yarn factories. Food processing, including the processing of local agricultural produce, remains the most important industry. More recent and modern industry feature high technology and the tertiary industry characterized by tourism trading and service. Guilin has the most High-speed Rail stations out of all cities in China. Guilin Main Train Station and Guilin North Train Station are on the Hunan–Guangxi railway, Hengyang-Liuzhou High-Speed Railway and Guiyang–Guangzhou high-speed railway, the main railways connecting Guangxi with central and southern China. Arriving to North Station, high-speed trains between Guilin and Changsha and Beijing came into operation in December 2013. In December 2014, high-speed operations began connecting Guangzhou, Shenzhen, Guiyang, and Shanghai. This made it more convenient for people to come to Guilin. It takes only about 2 or 3 hours from Guangzhou to Guilin, 9 hours from Shanghai to Guilin and 13 hours from Beijing to Guilin. Trains traveling between Kunming South and West Kowloon stations (for example) stop at Guilin West railway station. The city's public transportation includes bus routes and taxis. Guilin is the leading city in Mainland China operating double-decker buses regularly on major routes; in its main street the double-deckers run one-by-one almost every minute. Sightseeing boats also run on the city's canals and lakes. 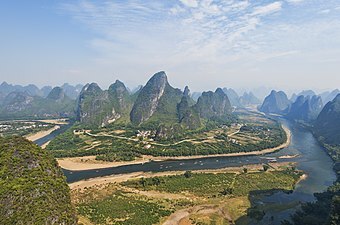 Wikimedia Commons has media related to Guilin. Guilin cuisine is a mixture of Cantonese cuisine and Zhuang cuisine. It is known for its snacks and the use of spices, especially chili. Guilin chili sauce (桂林辣椒酱), used widely in cooking by locals, is made of fresh chili, garlic, and fermented soybeans, and is considered one of the city's Three Treasures (桂林三宝). The other two of the Three Treasures are Guilin Sanhua Jiu (桂林三花酒), a variety of rice baijiu, or liquor distilled from rice; and Guilin pickled tofu. Guilin rice noodles have been the local breakfast staple since the Qin dynasty and are renowned for their delicate taste. Legend has it that when Qin troops suffering from diarrhea entered this region, a cook created the Guilin rice noodles for the army because they had trouble eating the local food. Specifically, the local specialty is noodles with horse meat, but this dish can also be ordered without the horse meat. Zongzi, a dumpling made from glutinous rice and mung bean paste wrapped in a bamboo or banana leaf is another popular delicacy in Guilin. "I often sent pictures of the hills of Guilin which I painted to friends back home, but few believed what they saw." The Guilin relationship with the New Zealand city Hastings started in 1977, after a research scientist, Dr Stuart Falconer identified a number of common areas of interest between the two cities, including horticulture and their rural-urban mix. In 1997 Guilin commenced an exchange relationship with Ōta, Gunma, Japan. ^ Foster, Simon (2012). Frommer's China. John Wiley & Sons. p. 612. ISBN 9781118223529. ^ a b c d "Overview of Guilin". people.com.cn (in Chinese). ^ a b "Guilin (China) Encyclopædia Britannica". Encyclopædia Britannica (Online). Retrieved 11 July 2013. ^ "Guilin never ceases to amaze". Retrieved 19 April 2016. 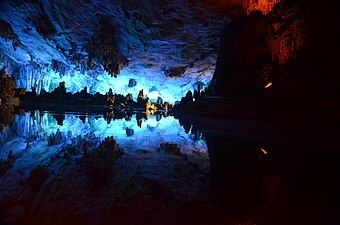 ^ "Guilin History". Retrieved 19 April 2016. ^ "Beijing Hotels 【 #1 Ranked Hotel in Beijing 】 - Nehow.com". Nehow.com. Retrieved 19 April 2016. ^ "Guilin Economy; china Window". Retrieved 11 July 2013. ^ "Guilin Tours, Guilin Tour Packages, China Travel Agency". Retrieved 19 April 2016. ^ "Learn Chinese, Study Chinese, Language, Study in China, Travel in China, Guilin". Retrieved 19 April 2016. ^ "Kumamoto International Foundation". Retrieved 19 April 2016. ^ "Miasta bliźniacze Torunia" [Toruń's twin towns]. Urząd Miasta Torunia [City of Toruń Council] (in Polish). Retrieved 2013-08-22. ^ "Tlaxcoapan se hermana con Guilin, China". Retrieved 19 April 2016. ^ "Hastings-Guilin Sister City relationship". Retrieved 19 April 2016. ^ 中華人民共和国広西壮族自治区桂林市 [Guilin, Guangxi Zhuang Autonomous Region, China] (in Japanese). Retrieved 20 June 2016.